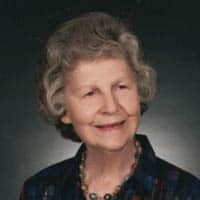 Elrica Kate Sowers Graham of Roanoke, formerly of Pulaski, Virginia, died December 31, 2018. Born in Willis, Virginia on March 3, 1926 to the late Mr. and Mrs. Harry Cline Sowers, Sr., her cherished memories always returned to her childhood days, growing up deeply rooted in faith, family, and community. After graduating from Willis High School and Marion Junior College, she received a B.S. Degree in General Science and Chemistry from Roanoke College, and later a M.S. Degree in Science Education from Radford University. Following WWII, she met Andrew L. Graham, Jr., and became his wife in 1946. Andrew had served with the 8th Air Force, and his Squadron, the 423rd, was the first over Germany. Shot down on his fourth mission as bombardier on a B-17, he survived 29 months as a German P.O.W. Andrew and Elrica were blessed with 55 years of marriage, four children, and four grandchildren before his death in 2002. Elrica was also preceded in death by two young daughters, Emily Karen Graham and Anne Sowers Graham; a brother, William Armand Sowers; and several uncles, aunts, and cousins. Survivors include her daughter, Amy Katherine Graham Brooks and husband, Donald, of Stuart, Florida; son, Mark Andrew Graham and wife, Rena, of Roanoke, Virginia; grandchildren and spouses, Amanda Leigh Brooks Cooper and Patrick, of Roanoke, Virginia; Aaron Matthew Brooks and Nicole, of Charlottesville, Virginia; Emily Rose Graham Hadacek and Jonathan, of Chicago, Illinois; and Katelyn Pope Graham Oliveira and David, of Atlanta, Georgia; great-grandchildren, Colin, Carleigh, and Claire Cooper; Jay and Stiles Hadacek; and, Mack Oliveira; a brother, Harry Cline Sowers, Jr. and wife, Patricia, of Midlothian, Virginia; and many nieces, nephews, and cousins. Elrica had the heart of a teacher, and she delighted in sharing discoveries w1th her science students over the years, teaching in several area schools. Her career as Earth Science teacher at Pulaski County High School brought new fields to explore. Her intense desire to open windows to God’s creation of the earth and universe led to field trips, science fairs, and evenings at the D. C. Wysor Museum and Observatory. As science club sponsor, she emphasized student research and participation in Virginia Junior Academy of Science proceedings. In 1976 she was named Best Earth Science Teacher in Virginia and in the Eastern Section of the United States. She was recognized as Outstanding Science Club Sponsor in Virginia in 1977-78. Her retirement years brought many new opportunities. She was a frequent visitor in elementary schools, delighting students with her hands-on rock shows. She had the joy of seeing a dream come true as she served 20 years as chairperson of heritage exhibits in the Pulaski County Old Courthouse. Her signature legacy features the geologic history of Pulaski County, Virginia, with panels of rock mounted along the staircase wall, “stepping stones in time.” In 2014, the Pulaski County Board of Supervisors named this exhibit ‘The Elrica Graham Gallery.” Over the years of her residence in Roanoke, she founded the Song Birds singing group at The Village at Pheasant Ridge to lead worship services and present special events. A 50-year Sunday School teacher, she was a lifelong church and community leader. An ardent advocate for the Pulaski Hensel Eckman YMCA and the D. C. Wysor Museum and Observatory, she also worked for historic preservation in the Count Pulaski Chapter, NSDAR. She received the ‘The Southwest Times Civic Honor” in 1995 and 2012. Elrica was a faithful member of St. John Lutheran Church, 4608 Brambleton Avenue, SW, Roanoke, Virginia 2401S, and she cherished worship and the Tuesday morning ‘Bible study with her “sisterhood.” A visitation and light reception at St. John will be held from 9:00 to 10:15 a.m. on Friday, January 11; with the funeral service at the church to follow at 10:30 a.m. Interment will be in Oakwood Cemetery, Pulaski. Memorials may be sent to either New River Community College, P.0. Box 1127, Dublin, Virginia 24084 for the Andrew L. and Elrica S. Graham Patriotic Memorial Scholarship or St. John Lutheran Church. Mrs. Graham was my Earth Science teacher at PCHS, 38 years ago. She was smart, sweet, and a pleasure to be around. Blessings to you, and your family as you celebrate her life! I was fortunate to have Elrica as my teacher at PCHS, and her passion for the earth entered with her to every class. I have great basketball and idle-time memories with Mark, giving more insight to what a special person she is. And now I learn she went to, Roanoke College, my school of choice. Thank you Erica .